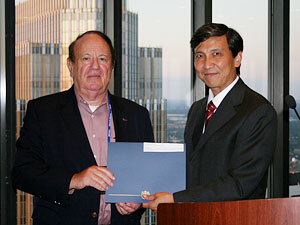 Glowinski (left) receives the 2011 Computational Fluid Dynamics Award from USACM President, Dr. J.-S. Chen. Roland Glowinski, Cullen Professor of Mathematics at the University of Houston, received the 2011 Computational Fluid Dynamics Award from the U.S. Association for Computational Mechanics (USACM) on July 25. The award, given every two years, recognizes outstanding and sustained contributions to the broad field of computational fluid dynamics. Glowinski’s award citation acknowledges his “outstanding contributions to establish computational mathematics for variational inequalities, extended domain methods, and others that enhanced computational fluid dynamics worldwide.” The award was presented at the 11th U.S. National Congress on Computational Mechanics. Presently, Glowinski is participating in research concerning the propagation of laser waves in optical fibers. He is carrying out the project at Oak Ridge National Laboratory for the Department of Energy. “While this study isn’t directly related to computational fluid dynamics, I’m applying some of the techniques for solving computational fluid dynamics problems to this work on optical fibers,” he said. A member of French National Academy of Sciences and the French National Academy of Technology, Glowinski has been on the UH faculty since 1985. In 2002, he received the Esther Farfel Award, the highest accolade bestowed by the University of Houston in recognition of faculty excellence.